You can’t go past the Pyroclassic IV for performance, style and build quality. Pyroclassic Fires have been making and supplying wood burning fireplaces in New Zealand for more than 30 years and now you can enjoy one too. With more than 100 colours to choose from, you'll find a colour you love! This website showcases the unique, clean, fuel efficient log burning stoves developed in New Zealand as "the cleanest most efficient wood fire". 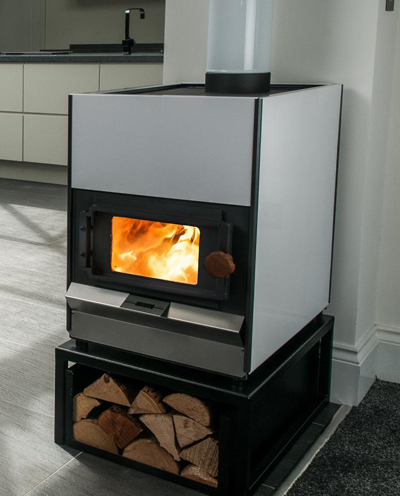 Here you can download a brochure which explains the outstanding fuel efficiency, water heating properties and the overnight 12 hour burn capabilities of this remarkable log burning stove. Information is given in the website on how to purchase Pyroclassic Fires or log burners in the UK. We are the only authorised UK Distributor of the fuel efficient Pyroclassic. Facility to produce hot water, the stove can be run wet or dry.